Teenage Mutant Ninja Turtles (1989, Konami [Ultra]) - NewRetroWave - Stay Retro! | Live The 80's Dream! The Ninja Turtles were our generation’s Pokémon. I can recall that from 1989 to about 1996, you couldn’t turn your head 90 degrees without seeing either a Batman logo or (more likely) that one up above. The Teenage Mutant Ninja Turtles, created originally as a (rather mature) comic by Kevin Eastman and Peter Laird, became wildly successful in the late 80s and early 90s. 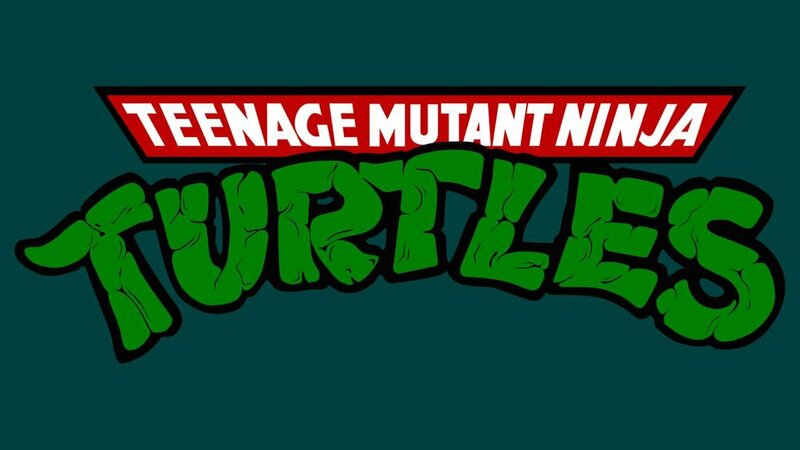 Though the comic strip had been around since 1984, TMNT became a franchise when it branched out and was marketed to kids. Part of that huge marketing empire was a little NES game made in 1989. 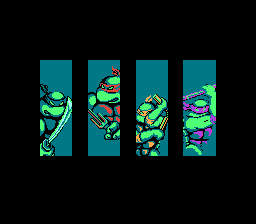 Leonardo, Raphael, Michelangelo, and Donatello. Remember in the Contra article when I said that Konami made so many games for the NES that they had to use a shell company to get around Nintendo’s licensing rules? 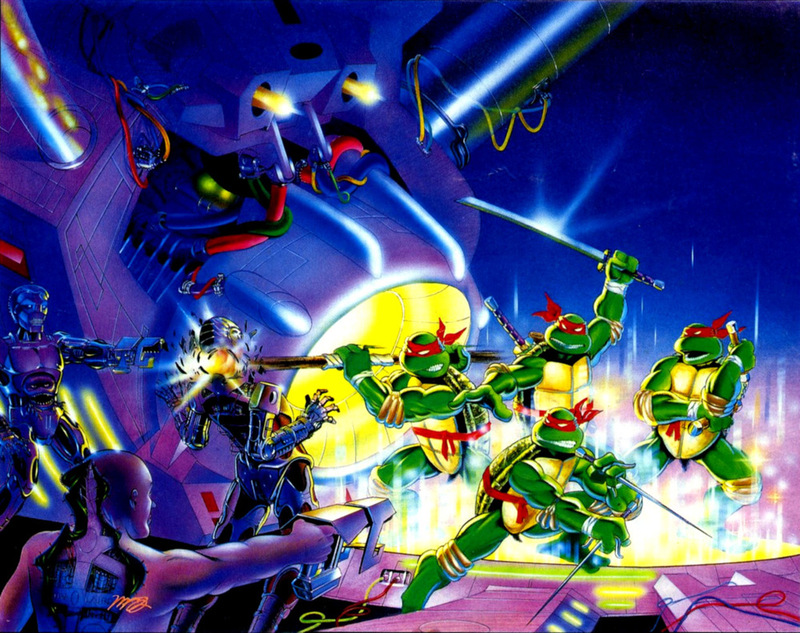 TMNT was one of those games, produced (at least on paper) by Ultra Games. Most of us didn’t pay attention to much of that as kids; the box could’ve said anything. 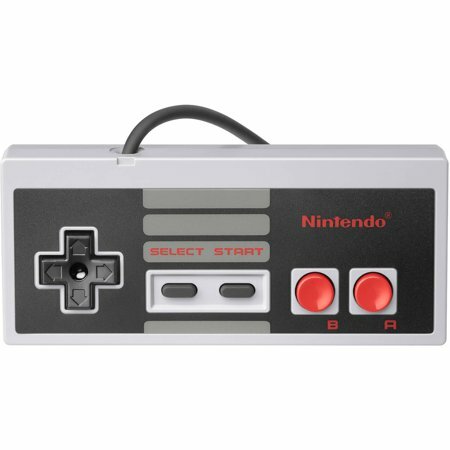 It could’ve said Chef Boyardee as long as the cartridge fit in our NES slot and played a Ninja Turtles game. 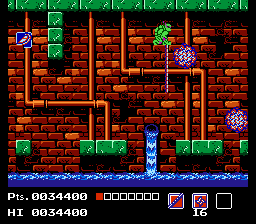 That said, many of us may also not have noticed the small ways in which TMNT was pretty gnarly for a 1989 NES title. While it’s above average at best in technical terms, the game was innovative for its time, in however small ways. The plot of the game involves rescuing April, then rescuing Splinter, and then finally defeating the evil Shredder. Both overhead and side-scrolling views are used, although the focus is pretty heavily on side-scrolling. 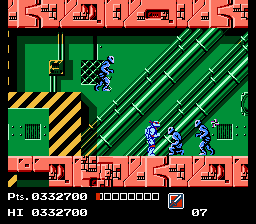 In top-down view, you sometimes have access to the Turtles’ van, which can run over Foot soldiers and shoot missiles at other baddies. By going down into sewers or into buildings, you enter side-view. This is where the real action happens. You control any of the four turtles, and are even able to switch between them at a moment’s notice. This can be used as part of a strategy; most players like to use Michelangelo and Raphael (whose weapons are shorter-reaching) to slog through parts where there’s lots of danger, saving long-reaching Leo and Don for bosses or other important bits. Pizza can be found to replenish the active turtle’s health bar, and while it is usually in out-of-the-way places, you may need it. You can also pick up boomerangs, throwing stars, ropes to climb across gaps, missiles for the van… it’s like a shopping trip down there in the sewer. A gross, dangerous shopping trip. I won’t post a whole carousel of images here, because this is a pretty good idea of what you’ll be looking at. This, and your turtles dying. 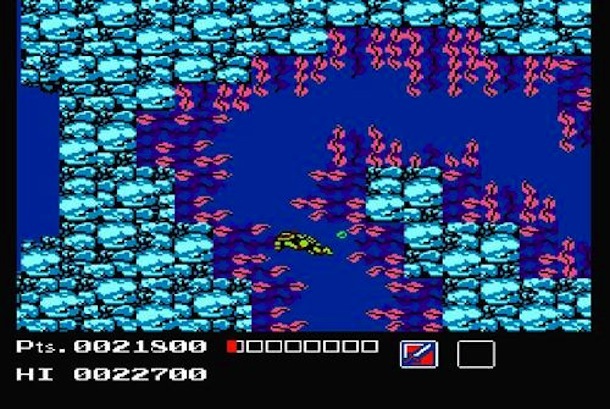 Let’s talk about the underwater level for a minute, because if you’ve played TMNT, you’re waiting for me to talk about it. You have two minutes and twenty seconds to disarm eight (8) bombs in an underwater maze full of electrical seaweed, insta-death tentacles, and intermittent shock-traps. First off, who even set those bombs? Who had the balls? Secondly, who fills their freshwater dam with such awful things? Don’t people have to go down there for maintenance? Thirdly, would you like to see a video of someone just hot-dogging the damned thing? It exists, just to compound the madness of it all. Now that we’ve talked about the underwater level, f*ck the underwater level. Just thinking about it makes my blood pressure spike. The graphics for TMNT were actually pretty sweet, especially since the turtles and their main enemies were usually easy recognizable. There are only a few cinematics, but they are decent. The soundtrack sticks out in my mind, both from repetition as a child and from it being a pretty good soundtrack. The sound effects included a lot of digitization, and it didn’t sound like crap, either. Remember that this game was actually produced by Konami, who didn’t screw around in terms of production quality. Yeah, I’ll be there in a while. I still have to beat the underwater level. Not everyone loved this game, but nearly everyone with an NES had a copy, because 1) it was TMNT 2) a lot of copies were produced. I’ve seen them a lot at pawn shops, swap meets, and flea markets. Almost all of them look well-played. I will speak on the level: TMNT was honestly a fair-to-middling NES game, but as a small part of one of the biggest franchises of an era, I felt that it very much deserved our attention. Later games would come; arcade ports, fighting games, and several other sequels dot the Turtle Timeline. The franchise is even enjoying a gentle breath of air as we speak, but it can probably never achieve the dizzying heights it did. Cowabunga, RetroFans! Next month, we’ll look at Golden Axe, Dragon Warrior, and more!